A Godzilla El Niño; Where Was the Rain and Snow? It was a Godzilla El Niño after all. Water temperatures in the eastern equatorial Pacific (which define an El Niño) were tied with the 1997-1998 El Niño as the largest ever at 2.3 degrees centigrade above average. However, snowpack was still below average in the Sierras where it was needed the most and also drier than normal in Southern California. What happened? There have been 24 El Niños since 1950 (water temp .5 degrees centigrade or more above average), but there is little more than a 50/50 chance that there will be above average precipitation during an El Niño. Expectations of gully-washing precipitation came from the only two El Niños where the equatorial ocean temperature was greater than two degrees centigrade above average (1982-1983 and 1997-1998). Those events produced huge amounts of precipitation. However, two data points turned out to not be enough to base a forecast of Godzilla precipitation even if the 2015-2016 El Niño ultimately lived up to expectations as one of the two largest in history. We learned this year that large El Niños are not necessarily predictors of record rainfall. The good news is that El Niño was discussed by television weather reporters, leading to more public understanding, even though some weather people continued to confuse El Niño as a precipitation event instead of an equatorial ocean water temperature event. Cuttent forecasts predict a La Niña condition by fall (ocean water temperature at the equator .5 degrees centigrade or less than average). More insight can be found here. 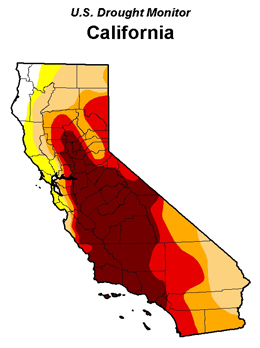 Despite average precipitation in Northern California, the state remains in a 17-year drought pattern that has persisted since 1999 as measured by Sacramento River runoff. 2006 and 2011 were the only two years since 1999 when precipitation exceeded average levels to a significant degree. Of note, 2006 was an El Niño year and 2011 happened during a La Niña.​ This year the Sacramento River is projected to flow at 84 percent of average. The state gained some ground on the drought, however. Although 97 percent of the state remains at some level of drought, the amount of the state in extreme or exceptional drought declined from 66 percent to 55 percent since April 1, 2015. This Los Angeles Times story provides additional perspective. Following an April 4, 2016, State Water Resources Control Board meeting, Chair Felicia Marcus praised Californians for their efforts in achieving 24 percent conservation, just short of the 25 percent statewide goal. Marcus said savings show "enormous effort and a recognition that everyone’s effort matters. Californians rose to the occasion, reducing irrigation, fixing leaks, taking shorter showers, and saving our precious water resources in all sorts of ways.” The water saved between June 2015 and February 2016 amounts to 1.19 million acre feet, enough to serve six million people for one year. Again, despite predictions of huge snowfalls, the critical snowpacks that serve the Colorado River and California's State Water Project are all slightly below average. 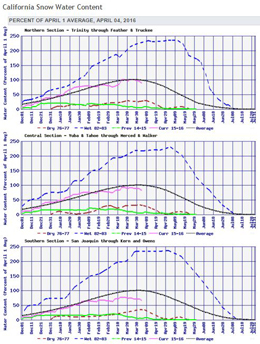 The Colorado snowpack that serves the Colorado River is at 94 percent of average, and the northern, central and southern Sierra snowpack are all below the April 1 average (see magenta line in image). 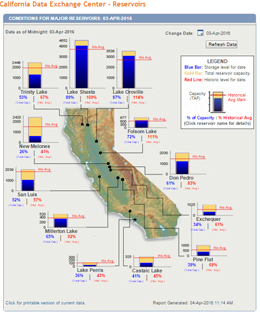 Although several major reservoirs are at above average levels thanks to late winter rain, the below-average snowpack will have its impact this summer when runoff will be less than needed to maintain above- average reservoir levels. Here's how the Los Angeles Times reported it. 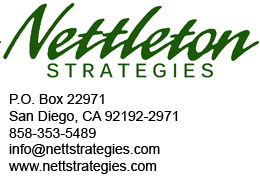 At Nettleton Strategies we always consider Oroville Reservoir a key indicator of California water supply since it is the largest reservoir associated with the State Water Project that brings water to Southern California. 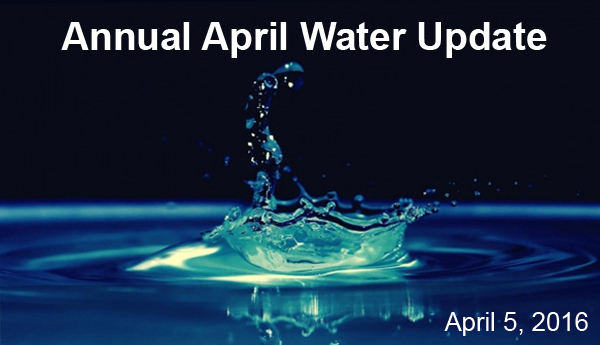 On April 1, Oroville was at 114 percent of average and 86 percent full thanks to several weeks of late winter rain. On this date last year, the reservoir was at 66 percent of average and 51 percent full. Lake Shasta is the largest reservoir serving the Central Valley Project and is similarly filled (109 percent of average). Most other other state reservoir levels are still well below average. The graphic shows blue as the current water level, the red line as the average, and tan as the amount when full. At 1,080 feet above sea level, Lake Mead storage levels continue to hover just above the shortage level of 1,075 feet. Below 1,075 feet shortage rules go into effect that do not effect California but would begin restricting both Arizona and Nevada. Lake Mead's Hoover Dam is the gateway sending Colorado River water to California. 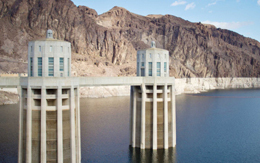 The U.S. Bureau of Reclamation estimates there is a 37 percent chance that Lake Mead will fall below the shortage level in 2017. Farms in California's Central Valley have suffered severe cutbacks because of the continuing drought and lack of water in key reservoirs. The more robust Colorado River system, despite being near shortage levels, has operated at full allocation throughout the drought. 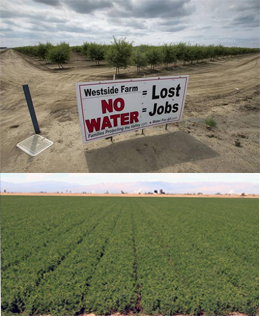 As a result, Imperial Valley farms have all the water they need. This situation points out the challenges of the water allocation system in California and the Southwest. Geography and water rights often make it difficult for regions to help each other. In 2015, the City of San Diego won the Wyland Foundation's National Mayor's Challenge for Water Conservation. In recognition of that success, the foundation kicked off its 2016 campaign in San Diego on April 1. The 2016 campaign will challenge residents to reduce greenhouse gas emissions, increase energy efficiency by making smart energy choices, eliminate hazardous waste from entering local waterways, and promote a greener lifestyle. San Diego's Climate Action Plan calls for achieving a 100 percent renewable energy portfolio by 2035. 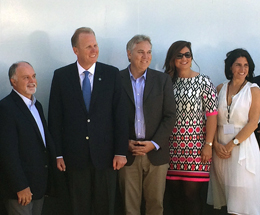 Mayor Kevin Faulconer was joined at the event by representatives from the Wyland Foundation, Toyota, SDG&E, Toro, and the U.S. EPA. Other big cities have joined the challenge, including Portland, Tucson and Dallas. The Orange County Water District (OCWD) supplies the Irvine Ranch Water District with potable groundwater. 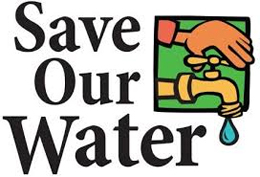 OCWD wants to build a desalination plant. Irvine Ranch doesn't want desal because of cost and because it currently has no need for additional supplies. How will this battle play out? A national water summit hosted by the White House on March 22 was designed to encourage private investment in water innovation. Several California organizations attended, including the State Water Resources Control Board the CleanTech Open, the WaterNow Alliance, and the Pacific Institute. According the the EPIC Energy Blog, a study by the California Independent System Operator (CAISO) and state legislation seek to understand how to renewable energy over-generation to reduce emissions related to energy use by water utilities. 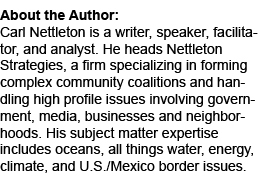 Copyright © Nettleton Strategies LLC. All rights reserved.